This wasn’t always the case. A few weeks ago, I stood in the Big Lots gardening aisle and held two bulb boxes in my hands. Day lily bulbs were on sale for only $2. Which should I choose? Pink or orange. The answer seemed so obvious. I left the store with an orange bulb, ready to plant it in an empty green pot immediately when I got home. A few weeks ago, I was amazed to watch the first flower come to life in our yard. Since we moved here in winter, we didn’t know that the homeowners had planted flowers up the bank on the side of our house. 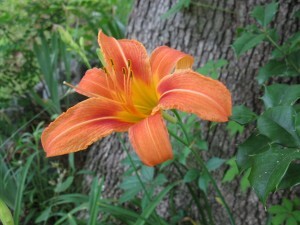 I couldn’t believe it when I saw the orange lily pop open. I spent that day and the next few days taking pictures of these orange lilies. I was so excited to see flowers. I guess I’d never realized that Milledgeville was too hot for flowers like these. Even though they aren’t mine, I thought it was good practice taking these pictures for when my own container plants eventually have their first blooms. But apparently orange lilies aren’t anything special. They keep showing up, day after day after day. I see them everywhere. Out our windows. In our side yard. In our backyard. Peeking out of our ravine. In the ivy at our driveway’s end. Across the street. In every house’s yard. In front of businesses. In the grassy median on the way to Walmart. Everywhere. Orange lilies are apparently the most popular flower of Hendersonville. I don’t get it. Where do they come from? Are they growing wild and taking over this town? Are people purposefully planting these orange lilies so they’ll match their neighbors? It is disturbing. Without realizing it, I joined the orange lily club with my Big Lots purchase. I am part of the problem. Apparently I bought the most boring flower ever. Why couldn’t I have just chosen pink? Pink is great. Pink is pretty. Pink is nowhere. So I guess along the way I became a gardening diva. I’m reminded of Madonna’s comments about hydrangeas (which you should youtube if you haven’t seen). When I see orange lilies on our drive through town, I turn my nose up and declare my hatred to Derrick. (He doesn’t seem to mind listening to me rant about orange lilies.) I look at my mystery lilies, and I pray that they’ll bloom any other color of the rainbow. I water my someday- orange lily regularly. I’ll take care of these plants because they are mine, and I’ll love them no matter what. But when I plan out my dream house and dream garden, the color orange will be nowhere in sight!